Gary Rogers; Derek Pender, Ian Bermingham, Connor McKenna, Evan McMillan; Stephen Bradley, David Mulcahy, Derek Doyle (Ian Daly 66), Anthony Murphy (Shane McFaul 66); Daryl Kavanagh, David McMillan. Barry Murphy; Mark Rossitor (Roberto Lopes 88), Ollie Cahill, Liam Burns; Aidan Price, Glen Cronin, Ger O'Brien, Steven Hurley (Kevin Feely 74), Killian Brennan; Anto Flood (Christopher Forrester 90), Christy Fagan. Nine-man Bohemians managed to hold on for a point in a thoroughly entertaining 1-1 draw with Dublin rivals St Patrick's Athletic in the rearranged Airtricity Premier Divison fixture at Richmond Park. Christy Fagan had been sent off before Liam Burns opened the scoring with a tap-in in the 52nd minute after a Killian Brennan free kick had been superbly saved by Pat's keeper Gary Rogers. Stephen Bradley equalised from the penalty spot in the 66th minute after Burns was shown a red card for deliberate handball. The visitors could taken the lead in the 11th minute when Killian Brennan tried his luck with a long-range free kick that Rogers needed two attempts to claim. Down at the other end Anto Murphy's driven shot from 30 yards was straight at Bohemians keeper Barry Murphy and just afterwards Daryl Kavanagh turned neatly in the box but his shot was at a comfortable height for Murphy. David McMillan, in for the injured Danny North, also made the Bohs stopper work with another shot from outside the box. It was all Pat's at this stage and McMillan's goal-bound volley was blocked before Murphy skipped past two defenders on the right wing but couldn't find the target from 15 yards. In the 32nd minute Rogers was called into action when Anto Flood managed to get a shot on goal for the northsiders but it was straight at the Saints' custodian. Five minutes later Kavanagh almost broke the deadlock with a deft flick from David McMillian's cross but the ball sailed inches wide of the post. Despite remaining scoreless it had turned into a very open game and Flood should have done better when he came onto Ger O'Brien's pullback but the striker didn't get enough power in the shot. With four minutes left in the first half Bohemians were reduced to 10 men. Christy Fagan, who had already been booked for a late tackle on Derek Pender, was shown another yellow for his challenge on Evan McMillan, much to the disgust of Pat Fenlon in the Bohemians' dugout. Seven minutes after the restart Bohs took the lead. Ian Bermingham pulled back O'Brien on the edge of the box and Brennan's curling free kick was superbly saved by Rogers. The rebound fell to Flood who attempted an audacious overhead kick that fell to Burns who tapped in from a yard out. The Saints' equaliser came from the penalty spot in the 66th minute. After a goalmouth scramble David McMillan and Kavanagh had attempts blocked and referee Tom Connolly produced a red card to goalscorer Burns for deliberate handball. Stephen Bradley sent Murphy the wrong way from the resulting penalty. 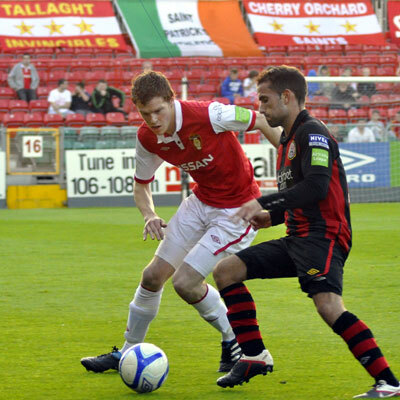 Bohemians then withstood relentless pressure in the final 25 minutes as the home side tried to find a winner. Birmingham and Shane McFaul had shots from distance and Connor Kenna and Evan McMillan came close with headers in the dying moments but Pat Fenlon's side managed to hold on for a point.